This isn't an orange alien planet. It's Earth, enveloped in an airglow. An eerie, marmalade-colored light show made Earth look like a gigantic orange lollipop, prompting an astronaut aboard the International Space Station to snap a photo of it on Oct. 7. And yesterday, NASA shared the glorious shot with Earthlings down below. The enveloping orange hue is known as airglow — a mesmerizing luminescence caused by chemical reactions high in Earth's atmosphere, NASA reported. This ghostly glow usually happens when ultraviolet radiation from sunlight energizes molecules of nitrogen, oxygen, sodium and ozone in the atmosphere. These energized molecules then bump into each other and lose energy as they collide, resulting in a faint but spectacular afterglow, NASA said. The radiating blush, also known as chemiluminescence, is comparable to glowing chemical reactions here on Earth, including those seen in children's toys such as glow sticks and glow-in-the-dark silly putty, NASA added. But airglow is more than an entrancing light attraction. It can also teach scientists about the workings of the upper atmosphere. For instance, it can shed light on how particles near the interface of Earth and space move, including how space weather and Earth weather are connected, NASA said. Researchers are already using satellites — such as NASA's Ionospheric Connection Explorer (ICON) — to study this dynamic zone. 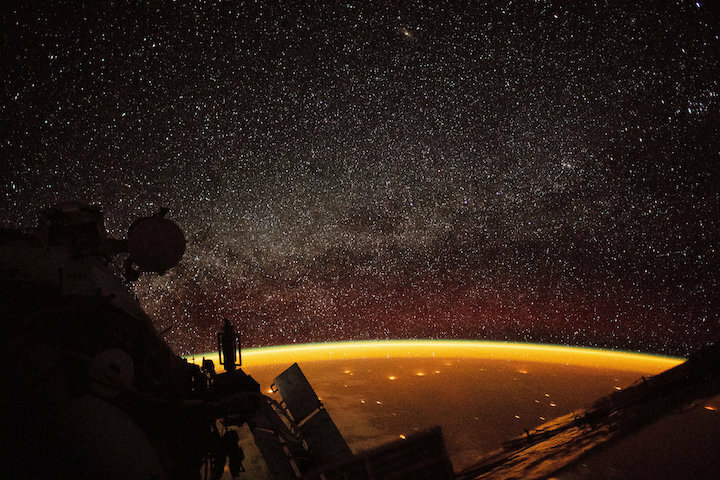 Although this airglow emanated orange, the phenomenon isn't always the color of the snack food Doritos. In 2016, a photographer in the Azores islands in the Atlantic Ocean took a photo of a rainbow-colored airglow, according to Space.com, a sister site of Live Science.